by Chris Woodford. Last updated: June 29, 2018. Have you ever gazed in amazement as a giant truck crawls slowly up a hill? Probably not! Such things happen everyday. But stop and think for a moment about what's happening—how a huge, heavy load is being systematically lifted against the overwhelming power of gravity using nothing more than a few cups of dirty liquid (fuel, in other words)—and you might agree that what you're seeing is quite remarkable. Diesel engines are the power behind our biggest machines—trucks, trains, ships, and submarines. On the face of it, they're similar to ordinary gasoline (petrol) engines but they generate more power, more efficiently by working in a subtly different way. Let's take a closer look! Photo: Diesel engines (like the one in this railroad locomotive) are ideal for pulling heavy trains. This is a superbly preserved (and highly polished!) British Rail Class 55 ("Deltic"), number 55022, called Royal Scots Grey dating from 1960. 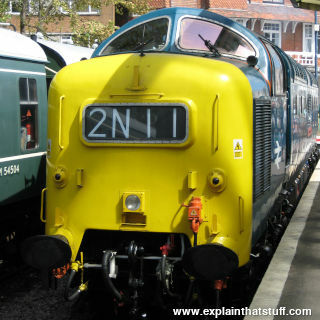 Here's a picture of the Napier Deltic diesel engine that powers it. Photo: A typical diesel engine (from a fire truck) made by Detroit Diesel Corporation (DDC). Photo by Juan Antoine King courtesy of US Navy. Like a gasoline engine, a diesel engine is a type of internal combustion engine. Combustion is another word for burning, and internal means inside, so an internal combustion engine is simply one where the fuel is burned inside the main part of the engine (the cylinders) where power is produced. That's very different from an external combustion engine such as those used by old-fashioned steam locomotives. In a steam engine, there's a big fire at one end of a boiler that heats water to make steam. The steam flows down long tubes to a cylinder at the opposite end of the boiler where it pushes a piston back and forth to move the wheels. This is external combustion because the fire is outside the cylinder (indeed, typically 6-7 meters or 20-30ft away). In a gasoline or diesel engine, the fuel burns inside the cylinders themselves. Internal combustion wastes much less energy because the heat doesn't have to flow from where it's produced into the cylinder: everything happens in the same place. That's why internal combustion engines are more efficient than external combustion engines (they produce more energy from the same volume of fuel). How is a diesel engine different from a gasoline engine? Gasoline engines and diesel engines both work by internal combustion, but in slightly different ways. In a gasoline engine, fuel and air is injected into small metal cylinders. A piston compresses (squeezes) the mixture, making it explosive, and a small electric spark from a sparking plug sets fire to it. That makes the mixture explode, generating power that pushes the piston down the cylinder and (through the crankshaft and gears) turns the wheels. You can read more about this and watch a simple animation of how it works in our article on car engines. 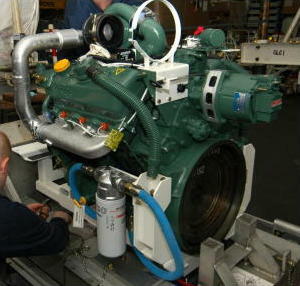 Diesel engines are similar, but simpler. First, air is allowed into the cylinder and the piston compresses it—but much more than in a gasoline engine. In a gasoline engine, the fuel-air mixture is compressed to about a tenth of its original volume. But in a diesel engine, the air is compressed by anything from 14 to 25 times. If you've ever pumped up a bicycle tire, you'll have felt the pump getting hotter in your hands the longer you used it. That's because compressing a gas generates heat. Imagine, then, how much heat is generated by forcing air into 14–25 times less space than it normally takes up. So much heat, as it happens, that the air gets really hot—usually at least 500°C (1000°F) and sometimes very much hotter. Once the air is compressed, a mist of fuel is sprayed into the cylinder typically (in a modern engine) by an electronic fuel-injection system, which works a bit like a sophisticated aerosol can. (The amount of fuel injected varies, depending on how much power the driver wants the engine to produce.) The air is so hot that the fuel instantly ignites and explodes without any need for a spark plug. This controlled explosion makes the piston push back out of the cylinder, producing the power that drives the vehicle or machine in which the engine is mounted. When the piston goes back into the cylinder, the exhaust gases are pushed out through an exhaust valve and, the process repeats itself—hundreds or thousands of times a minute! How does a diesel engine turn fuel into power? Animation: How a four-stroke diesel engine works. Like a gasoline engine, a diesel engine usually operates by repeating a cycle of four stages or strokes, during which the piston moves up and down twice (the crankshaft rotates twice in other words) during the cycle. Intake: Air (light blue) is drawn into the cylinder through the open green air inlet valve on the right as the piston moves down. Compression: The inlet valve closes, the piston moves up, and compresses the air mixture, heating it up. Fuel (dark blue) is injected into the hot gas through the central fuel injection valve and spontaneously ignites. Unlike with a gas engine, no sparking plug is needed to make this happen. Power: As the air-fuel mixture ignites and burns, it pushes the piston down, driving the crankshaft (red wheel at bottom) that sends power to the wheels. Exhaust: The green outlet valve on the left opens to let out the exhaust gases, pushed out by the returning piston. Exhaust and intake: Fresh air is blown into the side of the cylinder, pushing the old exhaust out through valves at the top. Compression: The inlet and exhaust valves close. The piston moves up, compresses the air, and heats it up. When the piston reaches the top of the cylinder, fuel is injected and spontaneously ignites. Power: As the air-fuel mixture ignites, it pushes the piston down, driving the crankshaft that sends power to the wheels. Two-stroke engines are smaller and lighter than four-stroke ones, and tend to be more efficient since they produce power once during each rotation (instead of once during every two rotations, as in a four-stroke engine). This means they need more cooling and lubrication and suffer higher wear and tear. What makes a diesel engine more efficient? Diesel engines are up to twice as efficient as gasoline engines—around 40 percent efficient, that is. In simple terms, that means you can go much further on the same amount of fuel (or get more miles for your money). There are several reasons for this. First, they compress more and operate at higher temperatures. A fundamental theory of how heat engines work, known as Carnot's rule, tells us that the efficiency of an engine depends on the high and low temperatures between which it operates. A Diesel engine that cycles through a bigger temperature difference (a higher hottest temperature or a lowest colder temperature) is more efficient. Second, the lack of a sparking-plug ignition system makes for a simpler design that can easily compress the fuel much more—and compressing the fuel more makes it burn more completely with the air in the cylinder, releasing more energy. There's another efficiency saving too. In a gasoline engine that's not working at full power, you need to supply more fuel (or less air) to the cylinder to keep it working; diesel engines don't have that problem so they need less fuel when they're working at lower power. Another important factor is that diesel fuel carries slightly more energy per gallon than gasoline because the molecules it's made from have more energy locking their atoms together (in other words, diesel has a higher energy density than gasoline). Diesel is also a better lubricant than gasoline so a diesel engine will naturally run with less friction. How is diesel fuel different? Diesel and gasoline are quite different. You'll know this much if you've ever heard the horror stories of people who've filled up their car or truck with the wrong sort of fuel! Essentially, diesel is a lower-grade, less-refined product of petroleum made from heavier hydrocarbons (molecules built from more carbon and hydrogen atoms). Crude diesel engines that lack sophisticated fuel injection systems can, in theory, run on almost any hydrocarbon fuel—hence the popularity of biodiesel (a type of biofuel made from, among other things, waste vegetable oil). The inventor of the diesel engine, Rudolf Diesel, successfully ran his early engines on peanut oil and thought his engine would do people a favor by freeing them from a dependency on fuels like coal and gasoline. If only he'd known! 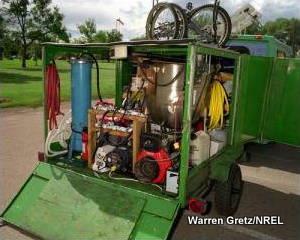 Photo: Have grease will travel: Joshua and Kaia Tickell, a couple of environmentalists, use this trailer (the Green Grease Machine) to make biodiesel fuel for their van (attached to the front) using waste cooking oil thrown out by fast food restaurants. The fuel costs an impressive $0.80 per gallon. Photo by Warren Gretz courtesy of US Department of Energy/National Renewable Energy Laboratory (DOE/NREL). Diesels are the most versatile fuel-burning engines in common use today, found in everything from trains and cranes to bulldozers and submarines. Compared to gasoline engines, they're simpler, more efficient, and more economical. They're also safer, because diesel fuel is less volatile and its vapor less explosive than gasoline. Unlike gasoline engines, they're particularly good for moving large loads at low speeds, so they're ideal for use in freight-hauling ships, trucks, buses, and locomotives. Higher compression means the parts of a diesel engine have to withstand far greater stresses and strains than those in a gasoline engine. That's why diesel engines need to be stronger and heavier and why, for a long time, they were used only to power large vehicles and machines. While this may seem a drawback, it means diesel engines are typically more robust and last a lot longer than gasoline engines. 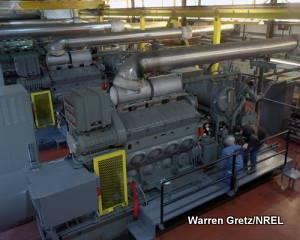 Photo: Diesel engines aren't just used in vehicles: these huge stationary diesel engines generate electricity in a power plant on San Clemente Island. Photo by Warren Gretz courtesy of US Department of Energy/National Renewable Energy Laboratory (DOE/NREL). Pollution is one of the biggest drawbacks of diesel engines: they're noisy and they produce a lot of unburned soot particles, which are dirty and hazardous to health. In theory, diesels are more efficient, so they should use less fuel, produce fewer carbon dioxide (CO2) emissions, and contribute less to global warming. In practice, there's some argument over whether that's really true. Some laboratory experiments have shown average diesel emissions are only slightly lower than those from gasoline engines, although manufacturers insist that if similar diesel and gasoline cars are compared, the diesels do indeed come out better. Other recent research suggests that even new diesel cars are highly polluting. What about CO2 emissions? According to the British Society of Motor Manufacturers and Traders: "Diesel cars have contributed massively to reducing CO2 emissions. Since 2002, buyers choosing diesel have saved almost 3 million tonnes of CO2 from going into the atmosphere." Diesel engines do tend to cost more initially than gasoline engines, though their lower running costs and longer operating life generally offsets that. Even so, car buyers no longer seem convinced: there's been a substantial drop in sales since the Volkswagen emissions scandal in 2015, where the German car maker misrepresented emissions of its diesel cars to make them seem less polluting. There's no question that diesel engines will continue to power heavy vehicles, but their future in cars and lighter vehicles is becoming increasingly uncertain. The push toward electric cars has provided a powerful impetus to make gasoline engines lighter, more economical, and less polluting, and these improved gas engines undermine some of the perceived advantages of using diesels in cars. In the growing competition between affordable electric vehicles and improved gasoline cars, diesels may find themselves squeezed out altogether. Then again, diesels themselves are constantly evolving; in 2011, the US Department of Energy predicted that future engines could rise in efficiency from today's 40 percent to 60 percent or more. If that happens, diesel will remain a contender for many years to come. 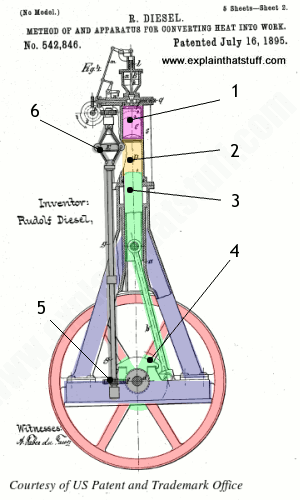 Artwork: Rudolf Diesel's original internal combustion engine, as he drew it in his 1895 patent. The cylinder (1) is at the top. 2) A "plunger" (as Diesel referred to it) is attached by a crank and connecting rod (3) to a flywheel (4). A gear driven by the flywheel (5) is attached to a centrifugal governor (6) that keeps the engine speed constant (shutting off the fuel supply if the engine runs too fast, then switching it back on when the engine slows down again). Artwork courtesy of US Patent and Trademark Office (with colors and numbering added by us to simplify the explanation). You can read more in US Patent #542,846: Method of and apparatus for converting heat into work by Rudolf Diesel. 1861: French engineer Alphonse Beau de Rochas (1815–1893) outlines the basic theory of the four-stroke engine and files a patent for the idea on February 16, 1862, but he fails to put together a working machine. 1876: German engineer Nikolaus Otto (1832–1891) builds the first, successful, four-stroke internal combustion engine. 1878: Scotsman Dugald Clerk (1854–1932) develops the two-stroke engine. 1880: Aged 22, Rudolf Diesel goes to work for refrigerator engineer Carl von Linde (1842–1934), where he learns about thermodynamics (the science of how heat moves) and how engines work. 1890: Diesel figures out how to make an improved internal combustion engine using higher pressures and temperatures, which doesn't need a sparking plug. 1892: Diesel begins patenting his ideas to prevent others from profiting by them. 1893: Diesel builds a huge, stationary engine that works for one entire minute, under its own power, on February 17, 1894. 1895: Diesel's engine patent is granted in the United States on July 16, 1895. 1898: With Diesel's help, the first commercial engine is built in a factory in St Louis, Missouri, United States by Adolphus Busch (1839–1913), brewer of Budweiser beer. 1899: Manufacture of diesel engines begins at Diesel's plant in Augsburg. Diesel begins licensing his ideas to other firms and soon becomes very wealthy. 1903: Petit Pierre, one of the first diesel ships, begins working on the Marne-Rhine canal in France. 1912: MS Selandia, the first ocean-going diesel ship, makes its maiden voyage. 1913: Diesel dies in mysterious circumstances, apparently falling overboard from the ship Dresden while traveling from London, England to Germany. Rumors circulate that he has been murdered or committed suicide, but nothing is ever proved. 1931: Clessie Cummins, founder of the Cummins Engine Co., builds one of the first successful diesel-engine cars and demonstrates its efficiency by driving it from Indianapolis to New York City on just $1.39 of fuel. 1931: Caterpillar revolutionizes agriculture by introducing the Diesel Sixty, its first diesel-powered crawler tractor, based on the popular Caterpillar Sixty. 1936: Mercedes introduces the 260D, one of the first mass-produced diesel-engined passenger cars, and it remains in production until 1940. Over the next four decades, Mercedes sells nearly two million diesel-powered cars. 1939: General Motors unveils its EMD FT, a powerful diesel-electric locomotive, and sends the first one (Number 103) on a year-long voyage to demonstrate its worth. Proving beyond doubt the superiority of diesel, this sounds the death knell for steam locomotives. 1970s: A global fuel crisis prompts renewed interest in using small, efficient diesel engines in cars. 1987: The world-famous Queen Elizabeth 2 (QE2) ship is refitted with nine diesel-electric engines (each the size of a double-decker bus), making it the most powerful diesel-powered merchant ship at that time. 2000: Peugeot introduces the world's first particle filters (PF) for diesel engines on its 607 model, claiming a 99 percent reduction in soot emissions. 2015: Volkswagen is plunged into a huge global scandal after systematically cheating on diesel engine emissions tests. Diesel car sales plummet for the first time in years. Handbook of Diesel Engines by Klaus Mollenhauer, Helmut Tschöke (eds). Springer, 2010. A comprehensive collection of academic papers covering the history and operations of all kinds of diesel engines. Two Prime Movers of Globalization: The History and Impact of Diesel Engines and Gas Turbines by Vaclav Smil. MIT Press, 2010. A fascinating social analysis of the diesel engine's impact on our lives. Biodiesel: Growing a New Energy Economy by Greg Pahl. Chelsea Green, 2008. A worldwide survey of biodiesel, including its history, future, and environmental impact. The Diesel Engine by Daniel J. Holt (ed). Society of Automotive Engineers, 2004. A collection of technical papers covering latest trends and developments in engine design. The Diesel Engine Reference Book by Bernard Challen and Rodica Baranescu. Butterworth-Heinemann, 1999. A comprehensive, well-illustrated guide to all forms of diesel engines and their applications, covering both road and maritime vehicles. Diesel: The Man and the Engine by Morton Grosser. David and Charles, 1978. If you're looking for a simple biography of Diesel, this very readable old book is well worth tracking down; it's fairly easy to find secondhand. The first part is a chronological account of how Diesel developed his engine, largely through an obsession with beating the efficiency of gasoline and steam. The last couple of chapters (about the state of world Diesel production) are extremely dated and not worth reading, but the first three quarters of the book remains perfectly relevant. 'Impossible-to-cheat' emissions tests show almost all new diesels still dirty by Damian Carrington, The Guardian, June 6, 2018. Diesel engines are overwhelmingly to blame for urban air pollution, new research suggests. How toxic is your car exhaust? by Tom de Castella, BBC News, October 17, 2017. Why modern diesels are dirtier than you think—and why European emissions controls, based on unrealistic laboratory tests, have failed to make them as clean as we expect. How Rudolf Diesel's engine changed the world by Tim Harford, BBC News, December 19, 2016. A brief account of Diesel's life (and controversial death). The Dimming of Diesel Fuel's Future in Cars by Conrad de Aenlle. The New York Times. December 8, 2015. Does diesel have a future in passenger cars? Diesel cars: Is it time to switch to a cleaner fuel? by Richard Anderson, BBC News, July 16, 2015. In terms of both pollution and emissions, diesel engines seem worse for the environment. Argonne Labs Simulates a Diesel Engine by Philip E. Ross. IEEE Spectrum. October 2, 2014. Why does it take one of the world's most powerful supercomputers to model what happens inside an engine? Diesel's Rational Heat Motor: A Lecture by Rudolf Diesel. Progressive Age Publishing, 1897. This fascinating transcript is a great place to go for a deeper technical insight into Diesel's scientific and engineering motivations. He sets out exactly what he was trying to achieve and how he went about it, briefly documents the history of his experiments to date, and includes some third-party tests that confirm the effectiveness of his engine. US Patent #542,846: Method of and apparatus for converting heat into work by Rudolf Diesel, July 16, 1895. The original Diesel engine, as described by the inventor himself in an early patent. US Patent #542,846: Internal combustion engine by Rudolf Diesel, August 9, 1898. A refined version of Diesel's engine described in a slightly later patent.